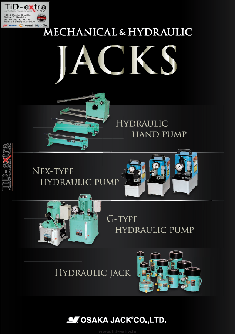 Company Osaka Jack is a leading Japanese manufacturer of hydraulic cylinders and industrial equipment for different industries. Since 1946., the company manufactures mechanical and hydraulic jacks, pumps and pumping stations, presses and wide variety of high capacity hydraulic tools. Products Osaka Jack have been widely used in shipbuilding industry, bridge construction, metallurgy, railway, road transport, construction of engineering structures, manufacturing of rigging systems, assembly and disassembly operations and port cargo loading. With 70 years of history, Osaka Jack products passed the test of time and are highly appreciated by not only Japanese and Asian customers, but also in the United States and Europe. Strong production and technical base together with rich experience, true to the Japanese quality, allows Osaka Jack to ensure reliable operation of their equipment for many years.